 A native of South Philadelphia's Little Italy takes a tour of the Americans who share his last name--an ingenuous travel tale by turns entertaining and just plain silly. 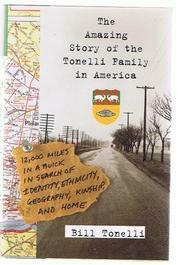 It all began in 1984 when the author responded to a piece of junk mail offering ``The Amazing Story of the Tonellis in America,'' a directory of all US residents with his own last name. Paging through the leatherette-bound volume, with its spurious family coat of arms (``crossed goats on a bed of linguini''), the 30-year-old Tonelli knew he was indulging in a cheap thrill but was shaken nonetheless by the concept of the ``Tonelli Nation.'' Even after he moved to New York and became a senior editor at Esquire, the author remained fascinated by the idea. Eventually, armed with an advance for this book, he set out on his road tour. Traveling 12,000 miles down the Eastern seaboard, across Texas to California, up to Alaska, and across the Midwest, Tonelli quizzes unsuspecting Tonelli dentists, nurses, football players, car dealers, nuns, museum directors, and one murderer on their tastes in tomato sauce, Godfather movies, and styles of social interaction. But the author fails to experience the jolt of tribal recognition he'd hoped for. Instead, the Tonellis, now two or three generations removed from their immigrant ancestors (who were in any case, it turns out, rarely directly related) turn out to be as randomly assorted as any bunch of people waiting at a bus stop. Their only special bond, Tonelli concludes with a freshly hatched (and sometimes wobbly) voice of authority, has to do with the people they might have been, had history not had other plans for them. Nevertheless, by simply dropping in on these perfect strangers and talking with them, the author has in a real sense claimed the Tonellis, and claimed America, too.